The second race in the final leg of the season approaches as Sebastian Vettel edges closer to his fourth consecutive Formula 1 World Championship. The Korean GP provides an interesting mix of characteristics to the drivers and engineers alike. The circuit starts off with three long straights and then the drivers suddenly enter a maze of tight twisty slow corners with a few fast corners thrown in for good measure. This makes setting up the car very difficult for the engineers, as they have to choose between speed on the straights or grip around the corners. The cars require good traction and mechanical grip out of the slow corners (Vettel should reign supreme here with his sputtering engine), while the fast corners require a high downforce aero setup, but that will compromise the straight line speed. Getting the compromise right will be the key behind being overtaken under the DRS zone or not. 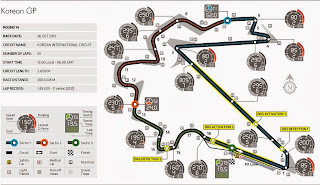 The asphalt is highly abrasive and since this circuit is used for little else apart from the annual F1 foray, the grip levels increase drastically from Friday morning till Sunday evening. Lotus have lost a lot in terms of technical prowess in the last few months and that shows in the development of their pace. Ferrari have also not improved as much as they would have liked and the car is going to require some Fernando magic to finish on the podium come Sunday evening. Mercedes were caught out at Singapore last race when Ferrari out-thought them in terms of strategy, but their car should be competitive around Yeongam. McLaren seem to have leap frogged Force India after the tyre compounds were altered and the pecking order behind behind the top four should remain as it was around Singapore.